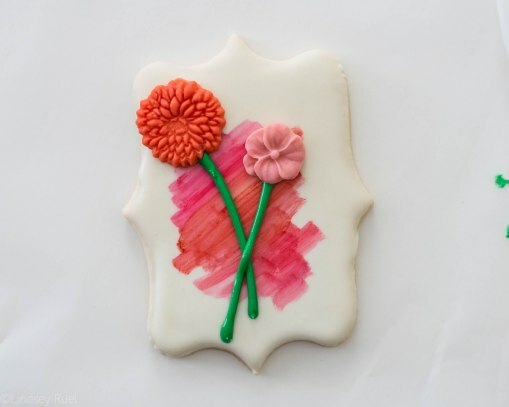 There are lots of things that inspire me and my cookie decorations, but I tend to find lots of inspiration from cake decorators! 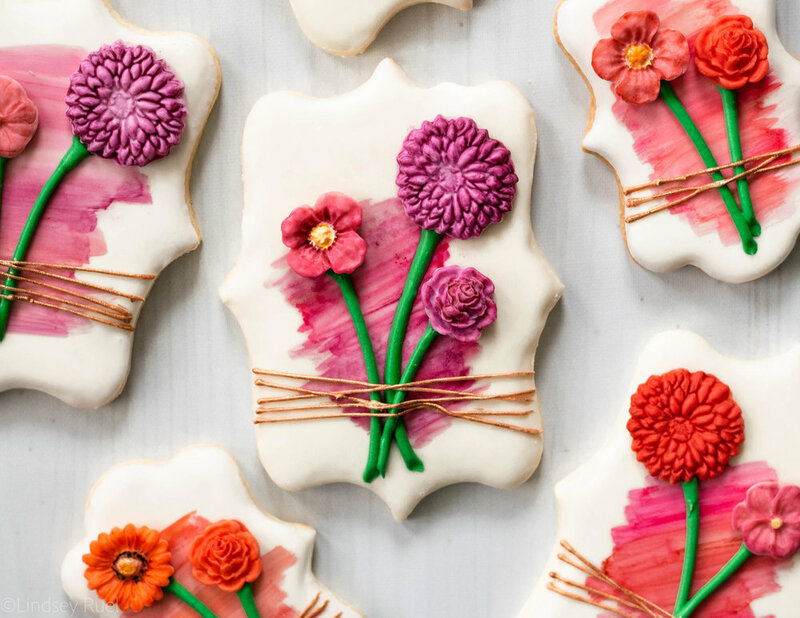 They are just so talented and are working with a very similar medium (and limitations), which make adapting certain cake designs to cookies pretty easy. These particular cookies were inspired by a cake an Australian cake designer who goes by @donttellcharles. His cake was very simple. A little bit of a painted effect topped with two beautiful ranunculuses, tied to the cake with a bit of twine. I mean, it's just gorgeous! Which is why I had to make something similar in cookie form. And while they aren't quite the same - they don't have fresh flowers on them - I did try to recreate the flowers using clay and fondant molds. For these cookies you will need sugar cookies cut into some sort of basic shape, like a rectangle or plaque. This was my first time using a fondant mold and it could not have been easier! Fondant is so similar to clay and is easy to shape using just about anything. I found one mold at the local craft store in the clay modeling aisle and I bought another one online that is specifically designed for fondant. Both worked the exact same way. First, color your fondant in whatever shades you'd like. Then press small amounts of fondant into the cavity of your mold. Make sure to really press and pack the fondant into all the groves. The fondant doesn't need to be dry or hardened before you can press the newly formed fondant flower out of the mold. But I would recommend letting them harden a bit before attaching them to the cookie. Once you are ready to assemble. Abstractly paint a few complimentary shades of diluted gel food coloring onto the iced cookie. Pipe the stems of the flowers where you would like them with the green stiff consistency icing. Then glue the flower onto the top of the stem with a little bit of extra icing. 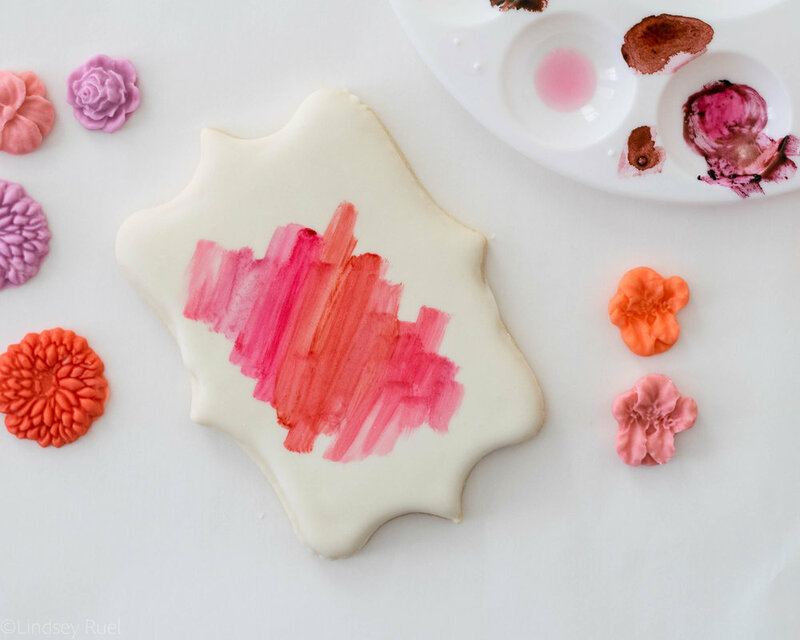 Create more dimension in the flower by painting it with gel food coloring diluted with a bit of alcohol until you have something resembling a watercolor paint. Finally, pipe the twine across the stems of the flowers. And voila! 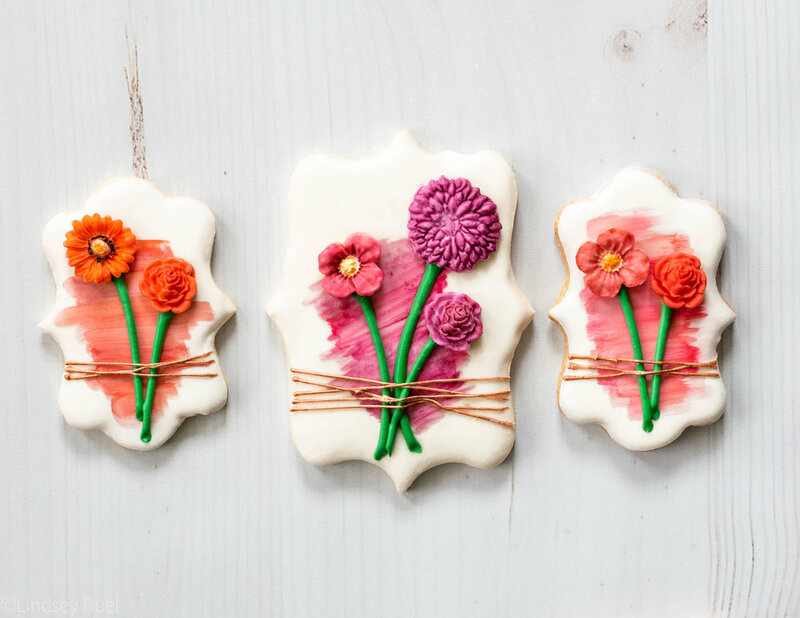 A beautiful bunch of fondant flower stems that look like that are tied to the cookie! So cute, right?